‘Panelaky’ is a colloquial term used by many in former Eastern Block countries to describe communist era apartment blocks, that can be found in almost every town and city of the former Soviet Union. These buildings were literally constructed with concrete panels. Spisska Nova Ves, Slovakia is no exception. These structures line the sprawl of the town marking the boundary between urban and rural. On the edges of town they loom and shadow over neighbouring farm fields... a continual reminder of a bygone era. 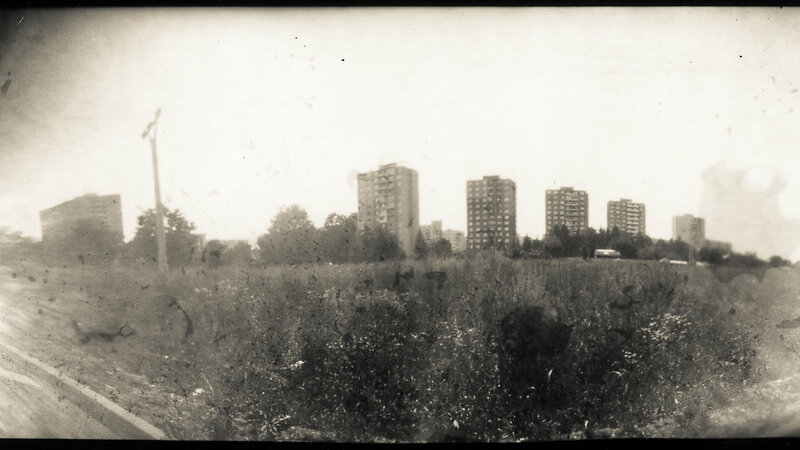 'Transits' is shot entirely on paper negatives with a hand built pinhole camera. The negatives were wet contact printed to create positive prints that were then scanned for video assembly. Texture in the images is entirely from the analogue printing process. The staggered and weathered look is reminiscent of early cinema, perhaps a film by the Lumiere Brothers; a recollection of another time – much like the sight of the ‘panelaky’.